Hyper Real charts the evolution of hyperrealism since the early 1970s and invites visitors to experience the familiar in extraordinary ways. With almost fifty artworks by thirty-two ground breaking artists, the exhibition pushes the boundaries of the hyperreal genre through sculpture, video, digital art, virtual reality and bio-art. Tickets: Tickets are on sale at the NGA and through Ticketek or 1300 795 012. When purchasing via Ticketek, enter HYPER40 for 2-4-1 tickets. Cartier: The exhibition is a breathtaking display of some of the world’s most exquisite jewels, featuring loans from royal families, celebrities and the astonishing Cartier collection. Immerse yourself in over 300 spectacular items, including royal tiaras, necklaces, brooches and earrings. Never before have so many incredible diamonds, pearls, sapphires, emeralds and other precious stones been seen in Australia. The NGA celebrates the recent return of copyright to the Namatjira Family Trust by extending Namatjira: Painting Country into 2018. In recognition of the philanthropic legacy of L. Gordon Darling AC, CMG and Marilyn Darling AC, the NGA presents a comprehensive survey of watercolours and painted objects by Western Arrarnta artist Albert Namatjira. Featuring 40 works of art gifted by the Darlings to the NGA, Painting Country captures the renowned Australian benefactors’ immense appreciation of Namatjira’s impact and lasting influence. These works have never been displayed in public. This important survey of Arthur Streeton’s war art brings together key works from collections around Australia and overseas. Streeton made significant contributions to the Australian war effort, serving with the Royal Army Medical Corps at the Third London General Hospital in Wandsworth from 1915 to 1917 before leaving for the Western Front as an official war artist in May 1918. Arthur Streeton: The Art of War explores Streeton’s experience of the hard realities of warfare through paintings and sketches filled with stranded war machinery, operations headquarters, dressing stations and field hospitals. 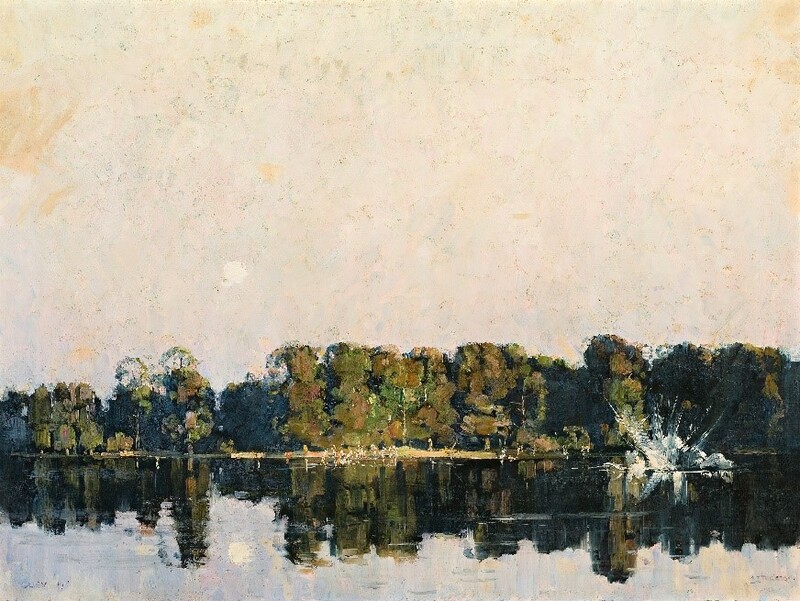 Arthur Streeton: Anna Gray and Virginia Hausseger in Conversation: Virginia Hausseger and exhibition curator Anna Gray discuss the artist and his work. Sunday 25 March 2.00pm. Image: Arthur Streeton, Troops Bathing Glisy 1918, oil on canvas. Private collection. The National Picture examines one of the most remarkable and contentious bodies of Australian colonial art. Focusing on colonial representations of Tasmanian Aboriginal people, this exhibition draws loans from national and international collections in a display that spans the declaration of martial law in Van Diemen’s Land in 1828 through to Duterrau’s death in 1851. Works from the 1920s to now reference and respond to the confronting issues that continue to arise from Tasmania’s colonial past. 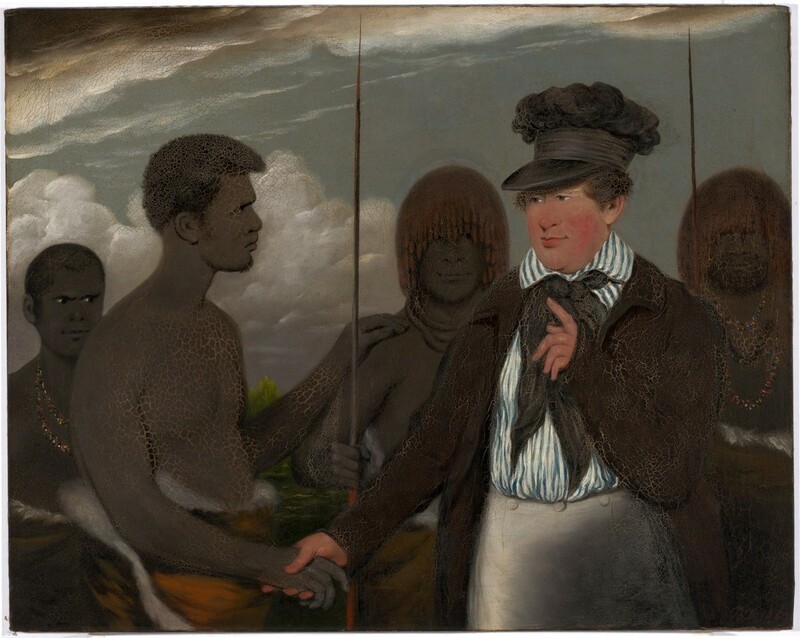 Image: Benjamin Duterrau, Mr Robinson’s First Interview with Timmy 1840, oil on canvas, National Gallery of Australia. Drawn exclusively from the National Gallery of Australia’s collection of American art, American Masters celebrates the nation’s most famous artists, working from the 1940s to the early 1980s. With many works on display for the first time, this exhibition demonstrates the full scope and depth of the Gallery’s collection of American art, from Colour Field, Pop, Neo-Dada and Super-Realism, to Conceptual, Land and Performance art. Highlights include Pollock’s Blue poles, Sol Lewitt’s huge wall drawing, specially re-made for this exhibition, and a selection of spectacular light works by Dan Flavin, Bruce Nauman, Keith Sonnier and James Turrell. Image: Jackson Pollock, Blue poles 1952, oil, enamel, aluminium paint, glass on canvas National Gallery of Australia, Canberra Purchased 1973. Enter a world of Love and Desire as the Tate Britain loans masterpieces from its unsurpassed collection of Pre-Raphaelite paintings to the National Gallery of Australia. In mid-nineteenth century Britain, Pre-Raphaelite painters flaunted convention and created a new artistic genre that weaved medieval romanticism with modern life. Curated by Alison Smith, Tate Britain’s lead Curator of 19th century British Art, Love and Desire features fifty of the most famous and best-loved works in Tate Britains’s collection, including Sir John Everett Millais’ beloved Ophelia and Holman Hunt’s Awakening Conscience, alongside forty loans from Britain and Australia. For the duration of the exhibition, the themes of Love and Desire will sweep through the NGA, filling the galleries with romance and poetry. Your gifts to the NGA directly support our learning and exhibitions programs and assist us to grow and strengthen the nation’s art collection. We are grateful to all our generous donors and supporters who are helping to build a better NGA for all Australians and visitors from around the world. Cash donations are fully tax deductible and can be made to support the acquisition of a work of art, to help us present our celebrated exhibitions and to develop programs for adults, families and children. Donations of $1000 or more in cash or works of art entitle you to become a member of the NGA Foundation. You will be formally acknowledged in the Foundation’s Annual Report, in our quarterly magazine Artonview and, for donations of over $100,000, your support will be acknowledged on the NGA's honour boards, where we are able to publicly thank our donors and celebrate major gifts. Of course, if you wish to remain anonymous, the NGA is respectful of your choice.